On September 10, Secretary Pompeo visited the U.S. 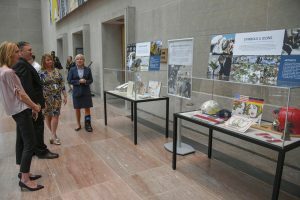 Diplomacy Center’s September 11 exhibit remembering the lives that were taken during the terrorist attacks and the survivors and first responders with lasting injuries or health complications. 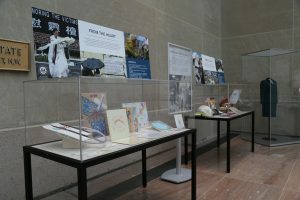 The exhibit features displays of condolence material from its collection that represents the outpouring of support felt worldwide after the attacks. The anniversary of September 11, 2001, also honors the heroes who rushed into the darkness to save lives and commemorates the contributions and duties of all public servants who keep America safe. The display is up through Friday, September 14, in the Diplomacy Center pavilion for internal staff and official visitors. After the September 11, 2001 terrorist attacks, U.S. embassies and consulates received condolence material such as flowers, candles, personal notes, drawings, and trinkets of all types to let U.S. citizens know that they were not alone in their pain. Many of these items were shipped to the Department of State in Washington, and now are included in the collections of the Diplomacy Center. This condolence material represents an unwavering support for Americans in their time of need and a global repudiation of terrorism. Students at Norwood School, Johannesburg, South Africa, sent a spiral bound booklet of colorful drawings and encouraging notes to the U.S. consulate. 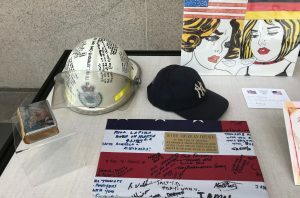 Firefighters from the New South Wales Rural Fire Service offered a helmet with heartfelt inscriptions to the U.S. consulate in Sydney, Australia. Schoolchildren in Japan created extensive chains of origami swans as symbols of peace. A U.S. embassy is a powerful symbol. The building and the dedicated people who work there represent American values and a commitment to the rule of law. Embassies are often targets as terrorists unsuccessfully attempt to silence our calls for freedom or halt the work of our nation, as we saw 3 years earlier on August 7, 1998, in Kenya and Tanzania. Embassies are also places to mourn where citizens worldwide gather there to show respect and solidarity with the American people in the face of tragedy, and play a part in national and international healing. The U.S. Diplomacy Center organized a small display of condolence material from its collection that represents the outpouring of support felt worldwide after the September 11, 2001, terrorist attacks. These are a few objects of condolence sent from around the world including South Africa and Australia.